The Beech BeechJet 400A is notable for its unique, vertically squared oval design, maximizing available space for headroom and shoulder room, ensuring a comfortable cabin. The Beech BeechJet 400A is the choice of United States Air Force for its reliability, durability, and advanced avionics systems. In 1985, the Beechcraft Corporation purchased the rights to the Diamond II from Mitsubishi. 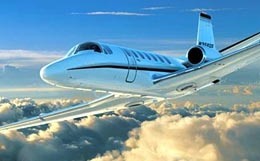 In 1986, the Beechcraft Corporation revealed the rename for Diamond II to be the Beechjet 400. Three years later, Beechcraft announced the Beechjet 400A as the next iteration in the Beechjet line. Upgrades incorporated into the design of the Beechjet 400A include increased payload capacity, increased service ceiling, and improved cabin noise control. Amenities include a refreshment cabinet, a rear lavatory, and a cabin baggage area. Production for both the Beechjet 400 and 400A ran from 1982 through 2003, when the Beechcraft Corporation was bought by Raytheon. 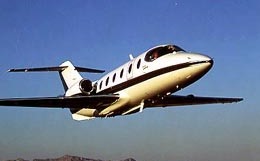 Production on the Beechjet 400A started in 1986 and ended in 2003. 350 aircraft have been built so far. The Beechjet 400A is designed to accommodate seven passengers with two crew members stationed at the flight deck. 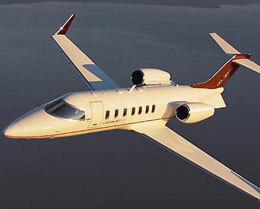 In a high-density configuration, this private business jet is capable of seating a maximum of eight passengers. 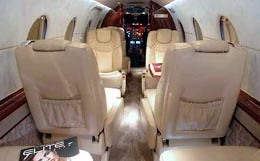 The cabin of the Beechjet 400A measures 15.6 feet in length, reaches 4.8 feet in height, and stretches 4.9 feet in width. This private business jet features 53 cubic feet of baggage storage capable of accommodating 870 pounds of luggage. With a maximum cabin pressure differential of 9.4 psi, the Beechjet 400A is capable of maintaining a sea level cabin altitude at an altitude of 24,000 feet. The Beechjet 400A comes equipped with two Pratt and Whitney Canada JT15D-5 turbofan engines. Each engine is rated at 2,900 pounds of thrust at takeoff. The Beechjet 400A requires 3,950 feet of runway to take off at sea level on a standard day. At an airport with an elevation of 5,000 feet, this takeoff requirement increases to 5,850 feet of runway. With four passengers, the Beechjet 400A needs only 2,730 feet of runway to land. 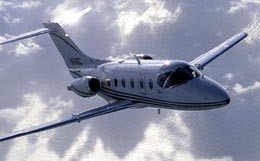 The Beechjet 400A features a maximum certificated service ceiling of 41,000 feet and a maximum range of 1,510 nautical miles. For a flight to a further destination, the Beechjet 400A is capable of maintaining an airspeed of 392 knots at an altitude of 41,000 feet in a long range cruise configuration. For a swifter flight, this private business jet is capable of maintaining an airspeed of 446 knots at an altitude of 35,000 feet in a high-speed cruise configuration. The avionics system selected for the Beechjet 400A is the integrated Collins Pro Line 4 avionics suite. Four 7.25-inch by 7.25-inch digital display screens provide instrument information, with three of these screens functioning as primary flight displays (PFDs) and one serving as a multifunction display (MFD). These screens are integrated with an electronic flight information system (EFIS), designed for reduced pilot workload and improved performance in the flight deck. Some of the instrumentation integrated into this suite includes the Collins FCS-850 digital flight control system, dual digital air computers, a Collins ALT-55B radio altimeter, a Collins WXR-840 color weather radar, a dual Pro Line II comm and nav radio system, and an AlliedSignal dual Global GNS-XMS flight management system (FMS). For more information about chartering, leasing or buying a Beechjet 400A please contact us by calling +44-20-3874-8091 or send us an email here.